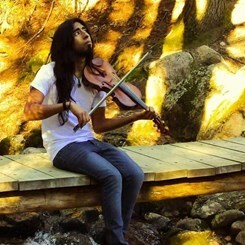 Peter Jay graduated from Berklee College of Music with a Bachelor of Music in Violin and Viola Performance. Although classically trained from the age of 6, Peter Jay spent his time at Berklee learning various types of Folk music and Contemporary Classical music. He has studied under Dr. David Wallace, Maeve Gilchrist, and world-renowned Old-Time Fiddler, Bruce Molsky. Peter Jay continued his education at the Royal Conservatiore of Scotland, in Glasgow, UK, where he earned a Master's degree in Traditional Scottish Music. He was fortunate enough to study with Marie Fielding and Alistair McCulloch, as well as have some Scots Gaelic tutoring from Iseabail MacDonald. Peter Jay has played in Boston Symphony Hall in Berklee Contemporary Symphony Orchestra, as a member of Chinese Pop icon, Leehom Wang’s orchestra, and under the baton of Arnie Roth for Final Fantasy: Distant Worlds. Peter Jay has also run a Handbell Choir and Vocal Choir, as well as taught violin, viola, and cello sectionals for Desert Ridge High School in Arizona. As an educator, Peter Jay believes that folk music is the threshold to a whole new generation of string playing and string players. He believes that, as strings become more prominent in pop music, string players will need a different set of techniques that only folk music can teach. Peter Jay believes that, not only does folk music teach a completely different set of rules than classical music, but also, with the right presentation, could become the forefront of pop music. Request Lessons with Peter Jay today!